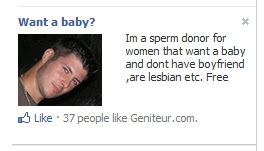 It says "I'm a sperm donor for women that [sic] want a baby and dont have boyfriend, are lesbian, etc. Free." The link leads to this facebook page. Hm. Somewhat in the start up stage. He says he may even be open to co-parenting. Isn't that nice.